If you’re reading this, chances are you, like me, have a passion for being outside, traipsing across mountains and down rivers. If that’s the case, I’m fairly confident you also care about environment sustainability. It doesn’t take an expert to realize that our environment is at a crucial point, in need of action. Many people are under the illusion that the only way to protect the earth from pollution, climate change, resource consumption, and a variety of other issues are through giant, expensive actions. While coating the entire surface of Kansas in wind turbines could have a tremendous impact on some of the current environmental issues, doing so isn’t practical. I’d like to place an emphasis on the often-overlooked smaller actions that are easy to incorporate into your life and still can have an impact. This summer, RRT would like to challenge you to take on these 6 small actions through out “Live Hopeful. 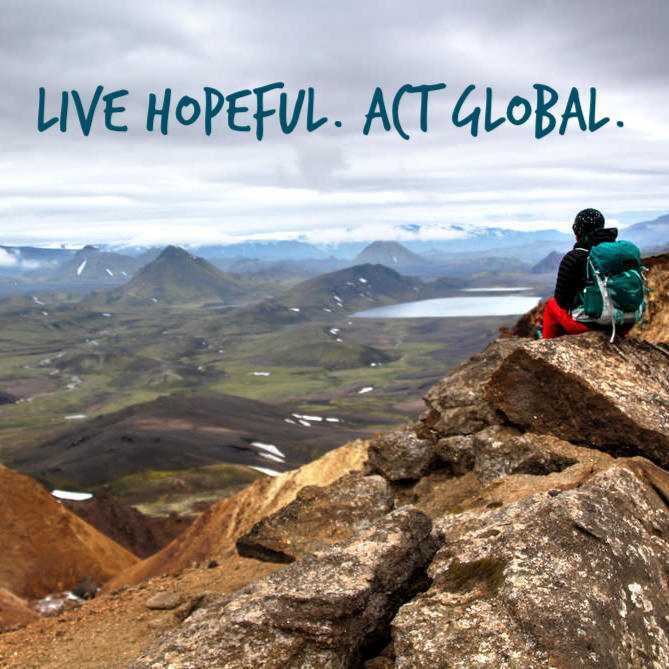 Act Global” Campaign. Although small, through collective action these ideas can have an impact. I challenge you to do these, but the goal is that in doing so you form eco-friendly habits that continue beyond this summer. According to The Plastic Pollution Condition, over 500 million plastic straws are used in the United States each day. Inevitably, a good portion of these straws end up in the ocean, where they contribute to the nearly 46,000 pieces of plastic in each square mile of ocean. To help put that into perspective, take a look at artist Chris Jordan’s stunning rendition of Van Gogh’s “Starry Night” that depicts just how much plastic that is. Check out a few of his other artworks in “Running the Numbers” if you’re interested in seeing a bit more about this issue and others. This month, try to go without using any plastic straws. Request your drink without them, or bring a reusable straw if you absolutely must use one. It’s a small piece that people don’t realize contributes to pollution, but it’s enough of an issue that Seattle has banned plastic straws to combat increased pollution. This is an issue that I struggle with on a near daily basis. It’s too easy to walk down the street and grab my usual cup of coffee from the Main Cup, then throw that cup away a half hour later. Try grabbing a Yeti Rambler instead or take a mug with you to the coffee shop and save the waste. In just a month I’ve made using a Yeti mug a habit. If coffee isn’t for you, try a Nalgene water bottle instead of disposable plastic bottles. Around 400,000 plastic bottles are used each minute in the US, so pick up reusable water bottle or a snazzy Yeti mug at RRT to help put an end to excessive waste. I’ve got a bad habit of packing my lunch for work in Ziploc bags almost every day. I’ll throw my sandwich and crackers into separate plastic bags because that’s the easiest way to pack. I’ve challenged myself not to do this anymore, however. I’m now taking a few extra minutes in the morning to pack my food into plastic containers that I can easily wash and reuse. If you do the same, it’ll make quite an impact on plastic pollution. Try bringing your own grocery bags to the store instead of using plastic bags over and over again. Look here for a staggering glimpse at just how many plastic bags the world consumes- 240,000 every ten seconds. On average, each of these bags is only used for twelve minutes. It’s not just the pollution from thrown-out bags that is damaging the environment. The ecological cost of producing plastic is quite detrimental. If you can go without plastic bags for a month, and even beyond that, the world might end up a bit cleaner. I think you’ll find that once you get into the habit of using reusable bags, it’s just as easy. You might not realize it, but the carbon pollution that goes into producing your store-bought fruits and vegetables is astounding. The global food system is responsible for a significant amount of global greenhouse gas emissions, with the transportation of food products being one of those contributors. Buying locally grown produce from a farmer’s market can impact these emissions by cutting back on the carbon emissions associated with transporting produce grown across the country to local distributors. Automobiles are another huge contributor to fossil fuel combustion and greenhouse gas emissions. With 260,000 gallons of gasoline burned in the US every minute, the ecological cost of driving is extremely high. My challenge is to skip one drive per week- walk to the grocery store, bike to work, or share a ride with a friend. Cutting out one drive each week is a good start to slowly decreasing the incredible fuel costs on the environment. Interested in joining the “Live Hopeful. Act Hopeful” Campaign by implementing these small actions into your daily routine? Head over to our Facebook page to comment with summer commitment and get rewarded with an in-store 20% discount!